Gold is enjoying one of the longest Bull-runs in modern history, with over a decade of price increases. Those who acquired Gold during this time have enjoyed some of the best returns anywhere on any investment. Even at the current trading price of $1630.20 per oz. Gold is still up 15% for the year to date. This out performs the S&P 500, the Dow & most other investments (including a number of hedge-funds). There are exceptions of individual stocks doing better but the losers have outweighed the winners for the year to date. In layman’s terms, Gold has been one of the safest investments in the last year & decade. During times of price volatility as happened over the last month many smart investors lose sight the facts and let emotion dictate their investment strategy. 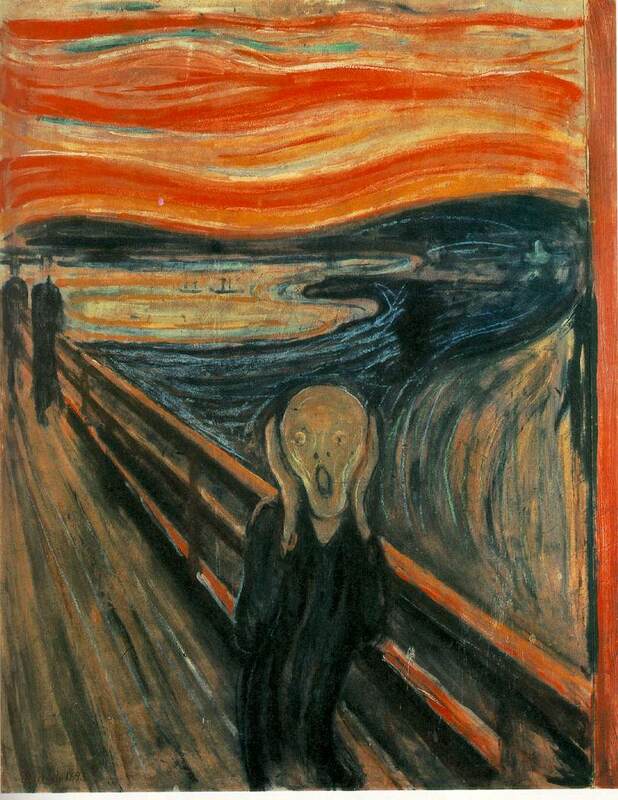 Directly speaking they panic, we all know the price one can pay when panic ensues. Think about Apple stock in 1996 nobody wanted it and were getting out. Yet, a simple $14,000 investment would net a $1.5 mil return today. It is the savvy investor who keeps a cool head allowing the panic of the masses to be an opportunity to improve their position in any investment. Why is the price dropping? Gold is being sold to cover losses and margins by major hedge-funds & Wall Street(see A Gold Rush Wanes). These sales are similar to the sell off of Gold holdings that took place to cover losses at the beginning of the Great Recession in 2008. During that same period of time Gold prices also retracted. September & October are the worst months for the markets is this the signal for another Recession? The average recession cycle is 3 to 5 years between each downturn. Some experts claim we are already well into a double-dip recession while others claim we are just in a slow recovery & growth period. In any case, while the price of Gold can be affected by downturns in the economy the over-all demand and pressure on Gold should continue to give positive returns. For the first time in 20 years all banking sectors are net purchasers in Gold. The Debt Crisis in the U.S. & Europe continues with little resolution that would change the need for Gold as a safe-haven investment. Finally, the demand by an emerging middle-class in China & India is growing to the point of almost 75% of all Gold mined is consumed by these two countries. September through the end of the year is the traditional wedding time in India now is the time they make a majority of purchases. Does the Dollars recent rise have any effect on Gold’s price drop? Absolutely! The Dollar’s recent climb out of all-time lows is contributing to the Gold price retraction. The Fed & EU banks recently made a plan to keep liquidity of the Dollar available to European banks with out question & at reduced rates for the next three months. This means the U.S. is preparing to help bail-out Europe’s banks with our money. This is good for the buying power of the Dollar in the short term. Long-term it can possibly lead to a default with the tax-payer holding the bag. Gold suffers on pricing in the short term while the long term outlook is bright and shining. We have always encouraged our clients to consider every retraction as a buying opportunity. We still believe this is true! While no one can tell the future we believe the fundamentals of Gold are as solid today as they were over the last decade. What is happening today is healthy for the long term growth of the metals market. There may continue to be some rough days in the Gold pricing still ahead. Until there is a fundamental change in the global economy that shows a marked improvement Gold will be the only real money you can own today. Gold is heading into uncharted territory according to some experts. Yet, others believe the charts show gold is a predictable asset class with the charts as a map. We fall more in to the latter category. This blog on occasion delves into the technical side of metals. Today we will look into three charts to see what they might yield. 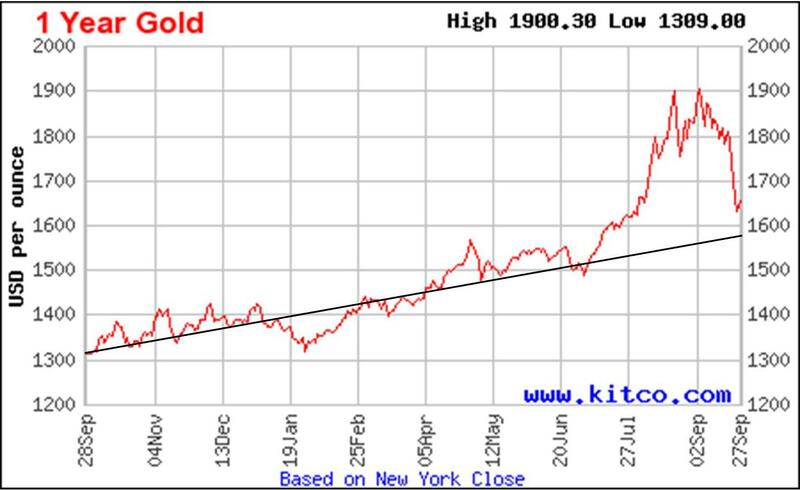 First is the one year chart: With a low of $1,309 and a high of $1,900.30 a median trend line ends up just below the $1,600 range. So what does that mean? With gold’s current spot price of $1,640 there is the potential for it to settle into a trading pattern not much further below $1,600. This is also supported by the next chart from the previous five years. Once again we see support at the median line of just below the $1,600 mark. Giving an indication of gold settling into a pattern of trading near this price point. Does this mean gold will be a straight line? Absolutely not, there will be dips & surges of the price just as the charts show but the indication is gold leveling into a position nearing $1,600. The final chart is really where the surges & retractions are broken down. The 10-year chart had 3 lines that give an indication of 3 separate scenarios. Base line in Black keeps to the lowest dips over the previous decade. It trends out to around the $950 mark for gold. We believe this is the worst case scenario. It also shows about the same 50% retraction that happened in the early 80’s in the market. The Blue line runs to the top position & is potentially unsustainable. 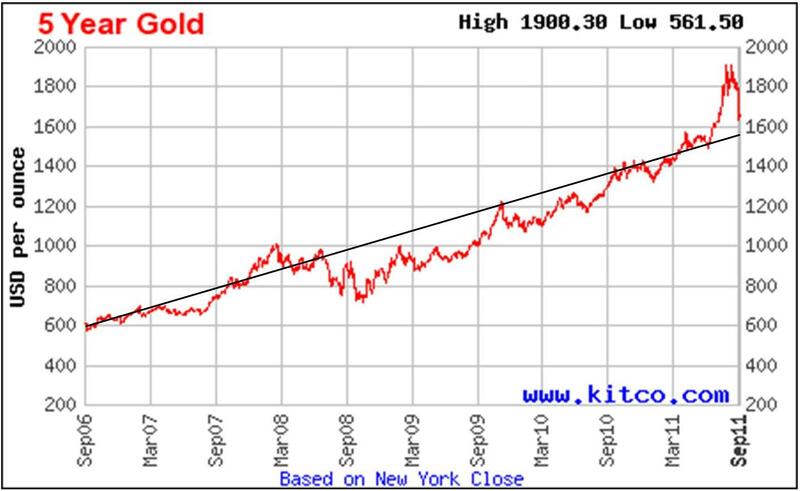 (This line sustains the $5,000 an ounce predictions) The Gold line is where we want to direct your real attention. It runs the middle of the two previous lines showing a reasonable outcome. It is the lowest median line of the three charts but still sustains over the $1,400 mark per ounce. 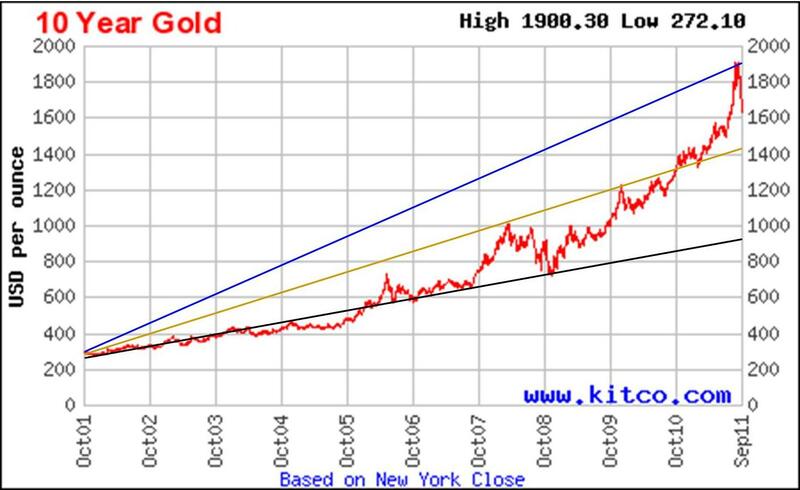 This final chart runs the gamut of where gold may go given its previous decade bull run. So what does all this mean? That gold has the potential to go higher or lower over the near & long term. What is important that you know the potential risk of gain or loss in your investing. Armed with this information one can go with confidence building a personal Tangible Asset Portfolio as financial insurance for you total net worth. Gold prices rose on Tuesday, as a drop in the dollar helped the precious metal snap a four-day run of losses and after an early rout in the previous session tempted price-sensitive physical buyers back to the market. Prices dropped more than $120 an ounce on Monday, an unprecedented intraday fall in value terms, as a rush for the liquidity of the dollar, losses in other markets, and a margin hike on CME gold futuresprompted selling. They had pared those losses to just 1.7 percent by the end of the session, however, and continued their recovery on Tuesday, climbing comfortably back above their 100-day moving average just below $1,640. Spot gold [XAU= 1659.89 33.04 (+2.03%) ] was up 2.5 percent at $1,667.69 an ounce, having peaked at $1,676.69. U.S. gold futures [GCCV1 1666.90 72.10 (+4.52%) ] were up 5 percent at $79.40 an ounce, or nearly 5 percent, at $1,673.20. On the currency markets, the U.S. dollar index [.DXY 77.53 -0.84 (-1.07%) ] fell 0.3 percent against a basket of major currencies after rising nearly 2 percent last week. A weaker dollar tends to benefit gold, as it makes dollar-priced commodities cheaper for other currency holders. The euro was also under pressure after comments from Spain’s economy minister dampened expectations that European policymakers would take radical action to contain the worsening sovereign debtcrisis. Concerns over euro zone debt and the outlook for the U.S. economy were key factors pushing gold prices to record highs above $1,920 an ounce earlier this month, as investors sought assets seen as a haven from risk. The worsening crisis has diverted them towards the dollar, however, at gold’s expense. Gold-backed exchange-traded fundsshowed few signs of a rout on Monday. Holdings of the largest, New York’s SPDR Gold Trust [GLD 161.9352 4.3552 (+2.76%) ], declined some 5 1/2 tons, but are still up 1.2 percent so far this month. Most major funds are still in positive territory for September in percentage terms, with the iShares Gold Trust [IAU 16.23 0.44 (+2.79%) ] and ETFS Swiss Gold [SGOL 164.89 4.31 (+2.68%) ] up 0.5 percent. Meanwhile, heavy buying of physical gold stocks—often a price-sensitive area of demand—suggested that Monday’s price fall had whetted investors’ appetite for the metal. Swiss bank UBS said it had seen very strong physical buying in Asia, particularly number one bullion consumer India, on Monday. “To be clear, physical demand right now is not just decent, it is exceptionally strong,” the bank said. Other precious metals also bounced back after Monday’s hefty losses. Silver which slid as much as 16 percent to a 10-month low of $26.04 an ounce on Monday. Silver [SICV1 32.835 2.859 (+9.54%) ] was up 11 percent at $33.30 an ounce. Platinum [PLCV1 1576.70 29.80 (+1.93%) ] was up 2.5 percent at $1,586 an ounce, while palladium [PAZ1 656.00 28.60 (+4.56%) ] was up 4.1 percent at $653.30 an ounce. Gold’s premium over platinum stood at nearly $90 on Wednesday, with a ratio of 1.06, its highest in 20 years. Over the past two weeks, spot gold prices have fallen as much as almost 15 percent and according to some analysts prices could fall further over the next few days before moving up again. “Precious metal prices are expected to exhibit a V-shaped pattern this week, where weakness in gold takes the market down to support near $1,580/oz before rebounding late in the week,” Tom Pawlicki, Precious Metals and Energy Analyst at MF Global, said in a report Monday. He added gold prices could rebound later in the week on bargain hunting and if the ECB takes further steps to aid Greece. Slovenia, Finland and Germany are expected to vote this week on whether or not to scale up the European Financial Stability Facility. “We favor buying a dip in gold at $1,580 and (are) targeting a recovery toward $1,700,” he said. Gold pulled back 8.6 percent last week, driven by a hike in margins, a stronger U.S. dollar and selling by hedge funds. 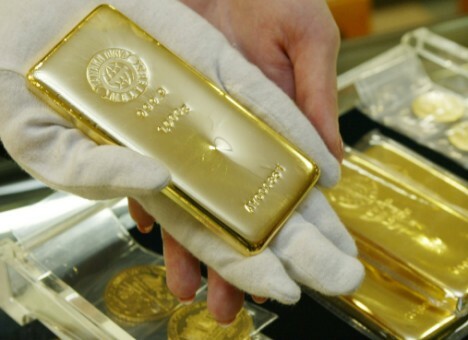 On Friday the CME raised margins for gold by 21 percent after a volatile trading week. “What we have started to see is a mass liquidation of hedge funds, the paper trade is going to be short and I think it’s going to form a beautiful bottom over the next couple of days,” Jurg Kiener, Chief Investment Officer at Swiss Asia Capital, told CNBC. 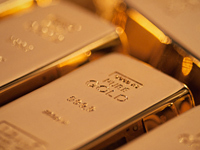 Kiener recommends buying physical gold or gold-mining stocks over ETFs. “The physical market in general is still very, very firm but the paper market overall is still all over the place,” he said. “I think profit margins for (gold miners) are still great as long as gold doesn’t fall below $1,100, so there is ample of room for cash flow to look fantastic,” he added. Given the volatility in the market some traders say gold is losing its sheen as a safe haven. “At the moment, I would say the safe haven is the U.S. dollar not really gold,” Michael Langford, Proprietary Trader at StreamTrading.com, said. Langford added that declining inflation expectations are also negative for holding gold. John Noonan, Senior Forex Analyst at Thompson Reuters, also said the recent volatility in gold is beginning to threaten its “safe haven” status. “Suddenly when you are getting 3 percent moves per session, (gold) doesn’t become much of a safe haven anymore,” he said. However, Noonan has not completely written off gold as a safe haven. “The currencies of the world are not presenting a great safe haven value either so I think gold will find a base and move higher again as a safe haven outlet,” Noonan concluded. One of the best known “gold bugs” is John A. Paulson, whose firm, Paulson & Company, is the biggest shareholder in the SPDR Gold Shares ETF. Is the smart money fleeing gold? For the better part of the last two years, some of the world’s biggest hedge funds have been piling into gold, betting the precious metal would provide an effective hedge against inflation or be a safer place to park cash as equity markets around the world stumbled. But to the surprise of many investors, when equity markets across the globe tumbled once again on Thursday, gold moved sharply lower as well. Gold futures for September delivery fell $66.30, or 3.7 percent, to $1,739.20 an ounce in New York. It was quite a turnabout for the metal, which has been soaring in recent months amid the turbulent stock markets. Hedge funds, which have been ratcheting down their positions in gold futures since early August, were quickly named as the culprits in the latest sell-off. The sell-off in gold was part of a broader move in the markets that had investors shifting away from perceived riskier assets, like commodities, and into the dollar in reaction to the Federal Reserve’s announcement on Wednesday of its new stimulus program. In addition, the Fed said that there were “significant downside risks” to the United States economy, which sent several commodities, including crude oil and copper, tumbling on Thursday on fears of a global slowdown in demand. Others say some hedge funds may be selling to meet redemption requests from investors who have been spooked by the recent market volatility and fear a repeat of the problems of late 2008. “A lot of investors are waking up to the realization that something is off. We’ve seen Goldman Sachs close its flagship fund, legendary hedge funds are down sharply, and I suspect we’re going to see significant withdrawals from some hedge funds this year,” said Michael A. Gayed, the chief investment strategist of the investment advisory firm Pension Partners. “The tendency for individual hedge funds or anybody is to sell winners before they sell losers. What’s been one of the few winners this year? It’s been gold,” Mr. Gayed added. Still, some are not yet ready to call the end of the gold rush. Even with the pullback, gold remains one of the most profitable investments this year with a gain of 22 percent. 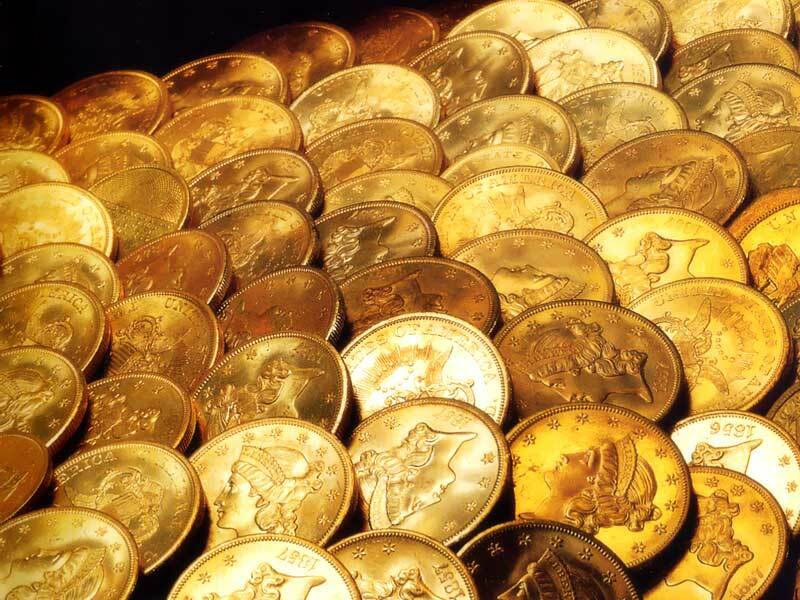 Some strategists have even predicted that gold will reach a record of above $2,300, which it hit during the early 1980s when adjusted for inflation and translated into current dollars. Likewise, the world’s largest exchange-traded gold fund, the SPDR Gold Shares, fell 2.6 percent on Thursday, but remains up 22 percent for the year. Gold, whether through futures contracts or via exchange-traded funds, has been a popular investment among some of the world’s largest hedge funds. 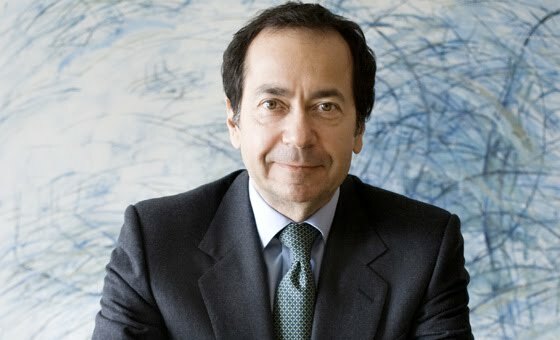 One of the best known “gold bugs” is John A. Paulson, whose firm, Paulson & Company, is the biggest shareholder in the SPDR Gold Shares ETF. But many other hedge funds have embraced the metal as well. After peaking in early August, hedge funds have been reducing their exposure in the gold futures market, according to Mary Ann Bartels, the head of United States technical analysis for Bank of America Merrill Lynch. 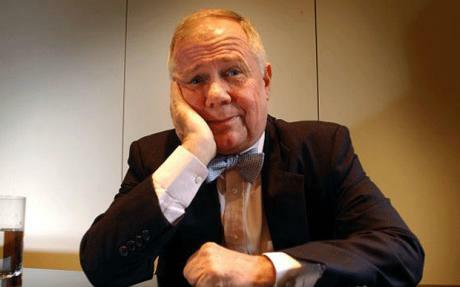 The U.S. dollar is going higher “against major currencies,” well-known investor Jim Rogers told CNBC Thursday. “The U.S. dollar is not a safe haven, if you ask me, but I do own it,” he added. Stocks plunged Thursday, fueled by ongoing global economic jitters in addition to a gloomy outlook from the Federal Reserve. The Federal Reserve announced it would launch a new $400 billion program in a move to rebalance its $2.87 trillion portfolio — a version of the widely expected Operation Twist—by selling shorter-term notes and using those funds to purchase longer-dated Treasurys. Ben Bernanke’s idea that low-interest rates are good, “is killing the people who save and invest, and that’s really hurting a very, very large part of the population,” concluded Rogers. There have been a number of experts talking up gold int he last month as gold has reached highs above the $1,900 mark. Most of these are calls to own gold stock. The bottom line—if you don’t own any gold, use this opportunity to start building a position in the precious metal that is at least more than 10 percent of your portfolio. Consider the sell-off to be a gift that you shouldn’t be getting given all that’s wrong in the world now, Jim Cramer of Mad Money said on CNBC. We believe this is the right call for your stock portfolio. But it is not the entire picture. The entire picture is your entire net worth. Stocks, bonds, house, IRA’s anything that makes up your net worth. Take that number and figure you should have insurance against a collapse of your net worth. We believe holding physical gold, silver & rare coins is the insurance solution for your finances. A Tangible Asset Portfolio at a conservative 10% to aggressive 20% of your net worth will secure your financial future against any failures of stocks, bonds, real estate, IRA’s & other investments. This portfolio should be diversified in gold, silver & rare coins not relying on one segment alone but using each to balance the whole. Look at your financial position today and make sure you have a fully funded TAP to insure against financial disaster. You are currently browsing the Mind Your Money blog archives for September, 2011.